Although their music evoked the raw, gospel-tinged sound of the rural South, Doug Clifford, Stu Cook, and Tom and John Fogerty actually hailed from El Cerrito, California, a small town near Berkeley. Back in 1960, while in junior high school, the boys formed a band called Tommy Fogerty & the Blue Velvets and spent much of their time practicing in the Fogertys' garage. They first recorded in 1964 as the Golliwogs; Tom Fogerty worked as a packing clerk in San Francisco at Fantasy Records, a jazz label. Fantasy released ‘Don’t Tell Me No Lies’, sung by Tom, in late 1964, but neither it nor the 1965 follow-up singles, ‘Where You Been and You Can’t Be True’, were played on the radio outside of their local area. They were just another Bay area bar band until ‘Brown-Eyed Girl’ sold 10,000 copies in California and adjoining states. It looked likely that they would stay that way because both John Fogerty and Doug Clifford were drafted into the Army. In 1967 John finished his stint in the army and the band picked up where they had left off, beginning by renaming themselves as Creedence Clearwater Revival. There are competing stories as to how it happened; it may have been the name of one of Tom Fogerty’s friends or it could have come from a beer commercial. A cover of Dale Hawkins's ‘Suzie Q’ was their first single in 1968; a cover of Screamin' Jay Hawkins's ‘I Put a Spell On You’ followed it. Both cover versions were on the band’s first album, which reached No.52 on the Billboard chart. In May 1968 they made their Avalon Ballroom debut on a bill with Taj Mahal; two months later they played the Fillmore West with the Paul Butterfield Blues Band. With ‘Suzie Q’ on the Billboard chart they played the Fillmore West three more times on bills with Fleetwood Mac and Jethro Tull. 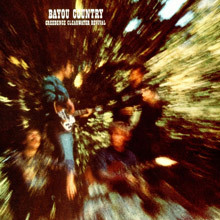 With the release of their second album, Bayou Country, it became evident that Creedence had an uncanny knack for writing hits. Their astounding string of successes continued with "Born on the Bayou," "Bad Moon Rising," and "Lodi." CCR were one of the few bands at Woodstock to have had significant success on the Billboard charts, yet many people today probably don’t even know that they actually appeared on the bill, because they did not feature in the movie or on the album. Their hour-long set was like a greatest hits album, with ‘Bad Moon Rising’ and ‘Proud Mary’ both having reached No.2 on the Billboard charts. As they walked on stage just after midnight on the Saturday their current record, ‘Green River’ was at No.15, it’s third week on the American chart; it would be their third single to stall at No.2. By 1970, CCR had undeniably become the number one American rock and roll attraction. The man responsible for their exalted position was John Fogerty. In addition to writing the band's material and producing their records, there was his soulful voice – he’s the archetypical ‘rock vocalist’. Put him into almost any great rock band of the 60s and 70s and he would have at least held his own as their lead singer and more often as not improved upon what they did. The same genius responsible for Creedence's tremendous popularity, however, also contributed to their eventual demise. Tensions arose among the other group members as they vied for greater say in band decisions, which had, till then, been made exclusively by John. An agreement for more democratic decision-making was reached, but came too late for Tom Fogerty, who left the band in 1971 to pursue a solo career. The remaining members went on to record Mardi Gras, and a double album, Live in Europe. The latter, which contained the Top Ten single "Sweet Hitch-Hiker," was the last album they recorded before the band officially disbanded in October 1972. John Fogerty pursued a solo career, although he refused to perform any CCR hits until 1987 when both Dylan and George Harrison told him everyone would think, “Proud Mary' is Tina Turner's song" unless he did them. ‘Rockin' All Over The World’ which Status Quo recorded in 1977 and took to No.3 in the UK charts, turning into their own ‘anthem’, came from John Fogerty’s second solo album. 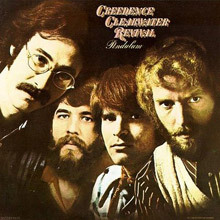 Creedence had an astonishing track record: eight consecutive gold singles (‘Proud Mary,’ ‘Bad Moon Rising,’ ‘Green River,’ ‘Down on the Corner,’ ‘Who'll Stop the Rain,’ ‘Up Around the Bend,’ ‘Lookin' Out My Back Door,’ ‘Have You Ever Seen the Rain?’) and seven consecutive gold albums (Creedence Clearwater Revival, Bayou Country, Green River, Willy and the Poor Boys, Cosmo's Factory, Pendulum, and Mardi Gras. There have been more than 100 cover versions of "Proud Mary," one of CCR's most enduring tunes. 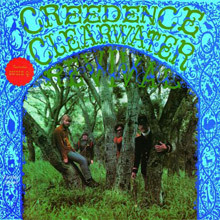 Creedence Clearwater Revival is the debut album by the American rock band Creedence Clearwater Revival, released in 1968. 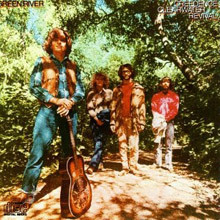 Green River is the third studio album by American rock and roll band Creedence Clearwater Revival, released in August 1969 after their second release Bayou Country which was released in January of the same year (see 1969 in music). In 2003, the album was ranked number 95 on Rolling Stone magazine's list of the 500 greatest albums of all time. It features two of the band's best-known songs, "Bad Moon Rising" and the title track. 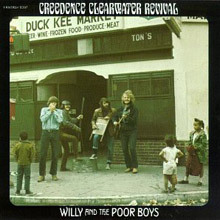 Willy and the Poor Boys is the fourth studio album by American rock band Creedence Clearwater Revival, released by Fantasy Records in November 1969, and was the last of three studio albums that the band released in that year (see 1969 in music). The album was remastered and reissued on 180 Gram Vinyl by Analogue Productions in 2006. The album features the songs "Down on the Corner", from which the album got its name, and "Fortunate Son," which is a well known protest song. In 2003, the album was ranked number 464 on Rolling Stone magazine's list of the 500 greatest albums of all time. 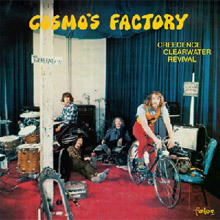 Cosmo's Factory is the fifth studio album by American rock band Creedence Clearwater Revival (CCR), released by Fantasy Records in July 1970 and released as Fantasy 8402, the same month as the single release of "Lookin' out My Back Door" b/w "Long As I Can See the Light". The name of the album comes from the warehouse in Berkeley where the band rehearsed early in their career. It was dubbed "The Factory" by drummer Doug "Cosmo" Clifford, due to the fact that bandleader John Fogerty made them practice there almost every day. Early pressings of the album contain a three-second dropout on the left stereo channel during "Before You Accuse Me" and an earlier mix of "Travelin' Band" with John Fogerty's first solo mixed behind the horn section. This mix was restored on the 40th anniversary reissue. The album is regarded as the band's best in their catalogue by critics and fans, including being ranked #265 on Rolling Stone's list "The 500 Greatest Albums of All Time". Pendulum is the sixth album by American rock band Creedence Clearwater Revival (CCR), released by Fantasy Records on December 15, 1970 — their second album release of that year (see 1970 in music). A single from the album, "Have You Ever Seen the Rain? "/"Hey Tonight", was released in January 1971. 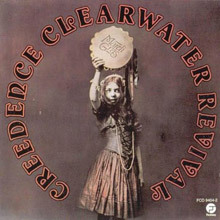 Mardi Gras is the seventh and final studio album by American band Creedence Clearwater Revival (CCR), released in 1972. The group disbanded after this album was released. 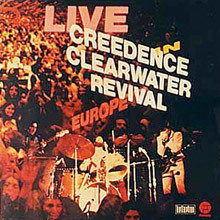 Live in Europe is a live album by American band Creedence Clearwater Revival, released in 1973 documenting the Mardi Gras tour. The album is notable because it is was performed as a trio following Tom Fogerty's departure. The record was released despite John Fogerty's strong objections.